The Research and Literary Students community of IPER Under Graduate College participated in the creative event “Creative Thoughts”. It had many interesting art-form activities such as painting and photography. 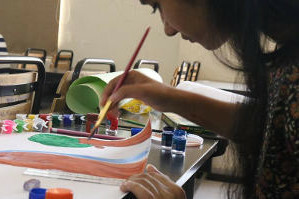 Students of BBA, BCom and BCom Hons had a day of learning and express their arts and skills. The event was held on 26th Oct 2018 at the IPER UG Campus premises. It included the following activity events – Poetry writing, story writing, and Photography contest. On the same day, students also attended a skill-based workshop on Blog writing. Abhishek Gaoshinde of BCom first year won the photography contest while Hradayesh Namdev of BCom Hons first year secured the second position. Muskan Jain won the first prize in Poetry competition, she is a student of BCom first year. Sajal Morchhale of BCom Hons first year won the second prize in Poetry competition. Saurabh Singh of Bcom Hons first year got the first position and Abhas Tiwari was the runner up in the story writing competition. Congratulations to all.